In this story, God wanted to show His power to the people and He used His prophet, Elijah, to do it. God sent rain in response to Elijah’s prayer after a long and devastating drought. 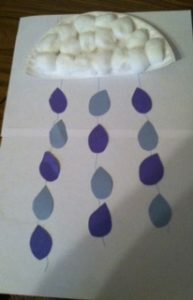 This “rainy day” craft will help remind children that God is a powerful God Who can do great miracles today just like he did for Elijah when we pray according to His will. 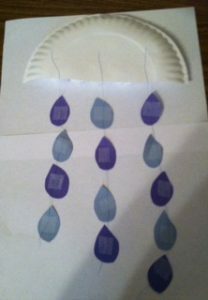 Teacher Preparation: Pre-cut small blue raindrops from the construction paper. Each student will need several. Pre-cut paper plates in half. Step 1. Give children a paper plate half and several cotton balls. 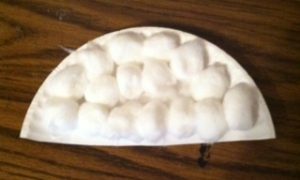 Instruct the kids to glue the cotton to the plate to create rain clouds. Step 2. 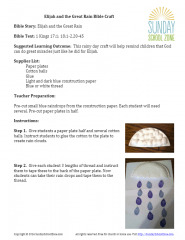 Give each child 3 lengths of thread and instruct them to tape these to the back of the paper plate. Now students can take their rain drops and tape them to the thread. Step 3. Have the kids turn the plate and rain drops over to see the cloud and rain.